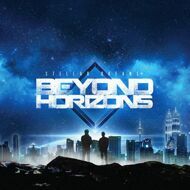 Both Iqwan and Khairil have chosen Beyond Horizons as our EP title mostly out of great interest and shared passion for the Sci-Fi, especially with the premiere of the Hollywood blockbuster "Interstellar" happening during the phase when we were in search for our next muse. The scores of the movie created by the legendary Hans Zimmer (from the movie "Inception") truly moved our hearts and we knew by then that we have found another piece of the universe to share with the world- Stellar Dreams' version. As soon as the chord strikes, Khairil immediately went to work on the drafts for our next upcoming EP, focusing on the outer-space concept and its many journeys thus bring forth the beginnings of Beyond Horizons. After months of preparation since November 2014, we have dropped our first single, "Parallel" this year's January and were quite relieved that our music listeners have given us positive feedbacks on their satisfaction over the said track, despite the different sound and vibes in comparison to its predecessors. However, difficulties over lack of fund and resources remained and we were faced with yet another sluggish phase in our productions. But we never gave up and persists with collecting funds to cover for our recordings and others in order to finish the EP. By August, the production is finally completed and we are ready to face the music against the world with better sound and in spirit.